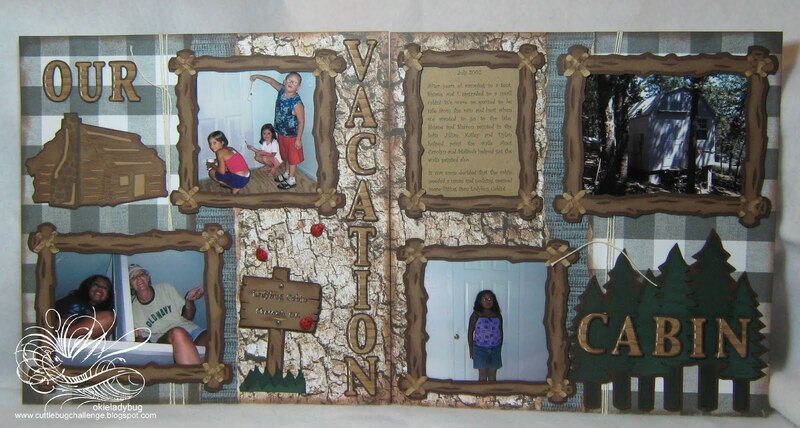 Vacation - A period of time devoted to pleasure, rest, or relaxation. Now when most folks think of vacations they think of far away destinations by sparking beaches or filled with amusement rides. Or maybe vacation is a trip to a national park or visiting distant family. Vacation is our theme this time for the Sweet Treats Challenge on the Cuttlebug Challenge. 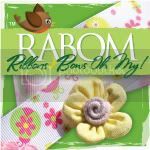 Make sure you hop on over to the Cuttlebug Challenge blog and see what my fellow designers have whipped up to share with you! 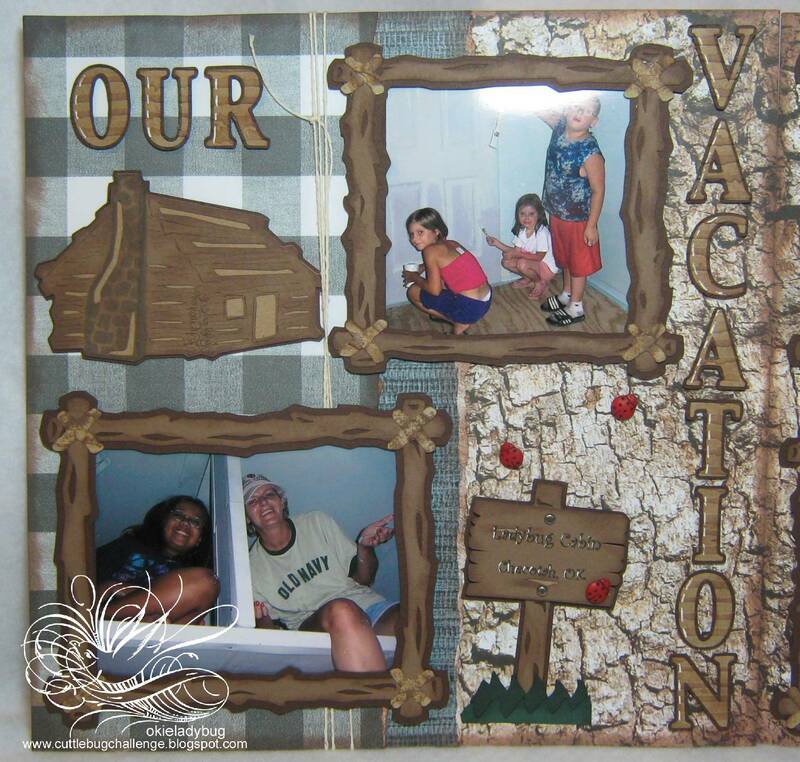 When I found out our challenge this time on Sweet Treats was Vacation I knew I needed to dig out some pictures that were much over due to be scrapped! I can't think of anywhere I rather vacation than my little cabin on Lake Eufaula here in Oklahoma. The cabin isn't much, but it doesn't have to be since it fits mine and my daughter's needs perfectly!! The cut file for the VACATION CABIN layout could easily be adjusted for your needs if you would like to download and use. *okie puts on her best television announcer voice* As always, the .cut file is free for personal use! *okie flashes her pearly whites like a tv announcer would do and winks*. Oh and don't forget to click on the pictures if you would like to see more close up details! Both cartridges used are available right now in the Cricut Rewards program! I believe CampOut is 400 points and BaseCamp is 800 points. I cut the title using Base Camp and it could easily be changed to something else if you do want to use the .cut file for the layout. 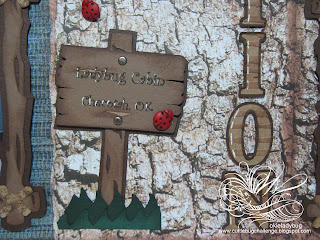 I put the letters through the Cuttlebug using the Distressed Stripes folder so they would look "woodsy". All the cuts other than the title are with Camp Out. I bought this cart sometime ago so I could scrap my lake pictures...and sadly, these are the first I have scrapped! *okie shakes head at her lazy self*. 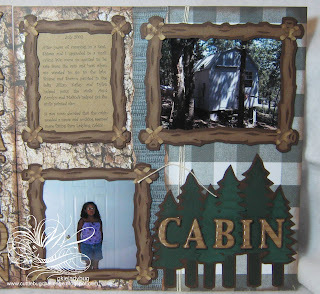 I decided to put the word "cabin" on the trees because I have difficulty allowing myself to layer things that aren't layered in life *okie can be a little OCD about some stuff*. I also went with masculine tones for the layout, which is not like me, but I think they were very befitting for the occasion! The "ties" were crumpled and then brushed lightly with ink to give them a more leathery look. Not sure it worked out that way, but that is what was intended. Here you can see some detail a little better on the sign. The ladybugs are some buttons and I snapped off the back and used Zip Dry Glue to attach them. That stuff is awesome for gluing embellies!! The grass at the bottom of the sign is actually the negative from the pine trees on the second page. 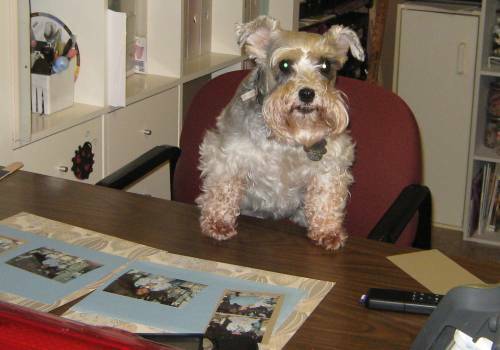 *okie says very prim and proper* Waste not, want not! Hope you enjoyed looking at the Cuttlebug Challenge layout projectd and reading another one of my goofy self narrated posts! *okie cracks up knowing she is a nerd and loves every minute of it*. Awsome page. 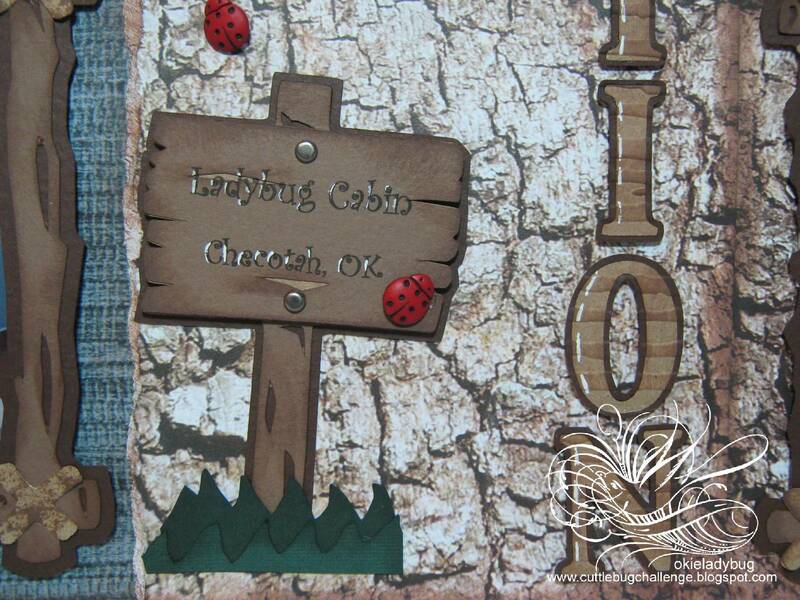 i like the die cuts you used. i want to do a camping page!have a good 4th of july! Thank you so much for this post. 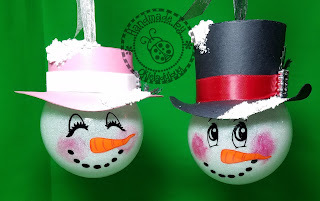 I want to let you know that I posted a link to your blog in Creative Busy Hands Cricut Freebies Search List, under the Elements post on Jul. 01, 2010. Thanks again. That is a truly awesome layout! What an awesome layout! I have the campout cart but I have only used it to decorate my son's room. Your page looks awesome! I saw your layout over on CC, and had to hop over to your blog to comment....this is awesome. 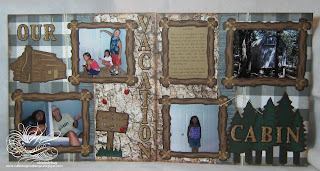 I love the way you framed the photos and journaling...a fantastic layout all around. TFS. What a great layout, your work is so detailed.....love it! If only I had a smidgen of your talent to craft with! Lady you are seriously talented! I wish you guys could see this layout in person! It's the very best one IMHO that Okie's ever made! She showed it to me yesterday when I met her to go to stamp club and it just blew me away! Love it! There's so much detail in it that you just can't appreciate just seeing the photo! What a fab layout, Okie! You can tell a lot of heart went into that. Love it! One fine layout, I wish I could be this talanted. Love it! love this. The details are amazing. Thanks for sharing. I love your cabin layout, and would love to know what type of cutter files do you use. When I go down to download it a different window comes up from what I am use too. Is it a SVG or MTC file by chance.